Befitting a man of a thousand moves, Hakeem Olajuwon has no definitive image, but definitive motions. The nimble footwork he picked up as a soccer player paid enormous dividends on the basketball court. He had a fluidity that defied any attempt to capture it in any single position. Hakeem was always fleeting, like a Dream, across the court and in the post. Olajuwon could swat any shot, steal any dribble, nail any jumper inside 20 feet, create any move inside 10 feet, escape any double team or trap, he was simply super human on the court. And that’s just the really impressive games. There are other ones like this February 1992 effort that only had Olajuwon going for 33 points, 12 rebounds, 9 assists, 5 steals and 4 blocks. For such a stunning player, however, Hakeem Olajuwon’s career wasn’t entirely steady. That motion that coursed through his on-court play seemed to also create numerous peaks and collapses. The early model of the Dream was a part of the Twin Towers experiment that proved enormously successful. 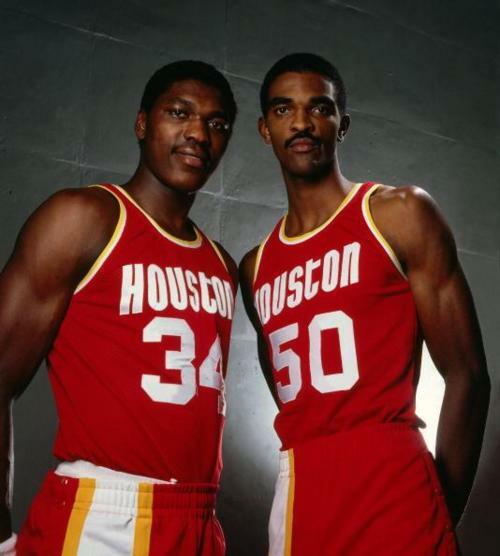 Hakeem and Ralph Sampson bum rushed the defending champion Lakers and pushed the Rockets to the NBA Finals where they won two games from the 1986 Celtics. That’s Celtic team is one many consider the greatest of all-time and these upstart Rockets were their toughest opponent that postseason. But by the very next year those Rockets fell apart amidst cocaine and injuries. Hakeem 2.0 was probably the Olajuwon at his absolute peak as a physical specimen. This Olajuwon was at his zenith in 1990 when he led the league in blocks and rebounds. He was also in the midst of a run of four straight seasons averaging over 2 blocks and 2 steals per game. He was the first player to do that for a single season, let alone four. Since then only David Robinson and Gerald Wallace have accomplished the task, but they each did so once. The Rockets in this stretch were a mediocre, hollowed out team kept barely at .500 by Olajuwon’s brilliance. Hakeem 3.0 was the nadir of Olajuwon’s career. It had been years since the Rockets had won a playoff series with the Dream. The Finals of 1986 were a pure fantasy to remember in 1992. The Rockets missed the playoffs and there were rumblings a disgruntled Olajuwon would be traded. However, in this dark shone through two tiny lights: a) Olajuwon began to take seriously his Islamic faith thus creating solemn confidence that would wreak havoc on the NBA in the following years and b) Rudy Tomjanovich took over as Rockets coach. Hakeem 4.0 was the apex of Olajuwon’s career. Rudy T created an offense of sharp-shooters to work off of Olajuwon’s dramatic post play. The Rockets lost in the Western Semi-Finals to Seattle in 7 games that season (1993), but it was merely a growing pain for the Rockets rebirth. Hakeem finished 2nd in MVP voting that year and the next season he would capture the MVP, Defensive Player of the Year Award, and the Finals MVP along with the NBA title. He remains the only player to secure all three of those individual awards in the same season. In 1995 Olajuwon again repeated as Finals MVP as he led a sixth-seeded Rockets team with no home-court advantage through four opponents who had 50+ wins. They remain the only the NBA champion to run such a gauntlet. Finally, there was Hakeem 5.0. The living legend who came close to another Finals appearance in 1997 with Charles Barkley and Clyde Drexler. After averaging a career-high 28 points per game at age 32, and still averaging 19 a game at age 36, Olajuwon succumbed to Father Time’s whims in 2001 at age 39. He was still better than the average center, but being better than average was not the standard set by Olajuwon. He retired as the NBA’s all-time leader in blocks. He was the only man to sit in the top 10 all-time for points, blocks, and steals. He retired 11th all-time in rebounds. Currently, he’s still the only player in the top 10 for points, blocks, and steals all-time. Among all NBA players from 1984-85 through 2001-02, Olajuwon was 1st in blocks, 2nd in rebounds, 3rd in points, and 4th in steals. He was a model of versatility, a paragon of unimpeachable post movement. When Hakeem had it going, which was quite often, you could only dream of stopping him.